The Annual Pickersgill Country Fair has been a delightful local “happening” for about 5 decades, rain or shine! It was a huge turnout at Pickersgill’s Country Fair 2017! Nearly 400 guests, including residents, family members, neighbors and volunteers of all ages, flocked to Chestnut Avenue on a beautiful autumn Saturday. There was much to enjoy; music, food, fun and shopping! The bluegrass sound of the Satyr Hill Band and the a cappella harmony of Port of Call Barbershop Quartet delighted the crowd from 10 in the morning until 2 in the afternoon. Classic carnival fare was in abundance; hot dogs, snacks and a bounty of bake sale confections. There was perpetual amusement for the young and young at heart; Cowboy Joe the balloon sculptor, the Oriole Bird!, a petting zoo, face painting, pony rides, as well as a $1-a-ticket raffle for a pair of Raven’s tickets. For those who like to treasure hunt – Pickersgill’s famous jewelry sale, flea market, book tables and white elephant shop were major attractions. Guests lined up an hour before the fair opened in anticipation of finding a special piece of furniture, a perfect knicknack or maybe a beautiful bauble to take home. Mr. Chuck Daniels, winner of the Ravens tickets, came to the Country Fair with his wife to shop at the White Elephant Sale. He said ” I’ve never really won anything before!” What a happy surprise , congratulations Mr. Daniels. What would a fair at Pickersgill Retirement Community be without a visit from Mary Pickersgill’s great-grand nieces! Jacquie Myers and Marylin Melton arrived from out of state on Thursday in time to host an afternoon tea for all Assisted Living residents who moved to Pickersgill in the past year. On Friday they visited new residents in the Decker Center where they gave out handmade blankets and pretty ditty bags stuffed with soaps and lotions. And at the fair on Saturday it was easy to spot the sisters despite the crowd as they were dressed in period costumes (circa 1812) complete with sun bonnets. The fun-filled day would not have been possible without help from volunteers and sponsors who made The Pickersgill Country Fair a success! Although the fair is first and foremost a friend-raiser, we are happy to announce that this year’s Country Fair raised nearly $9,000 to benefit the Pickersgill Benevolent Care Fund. 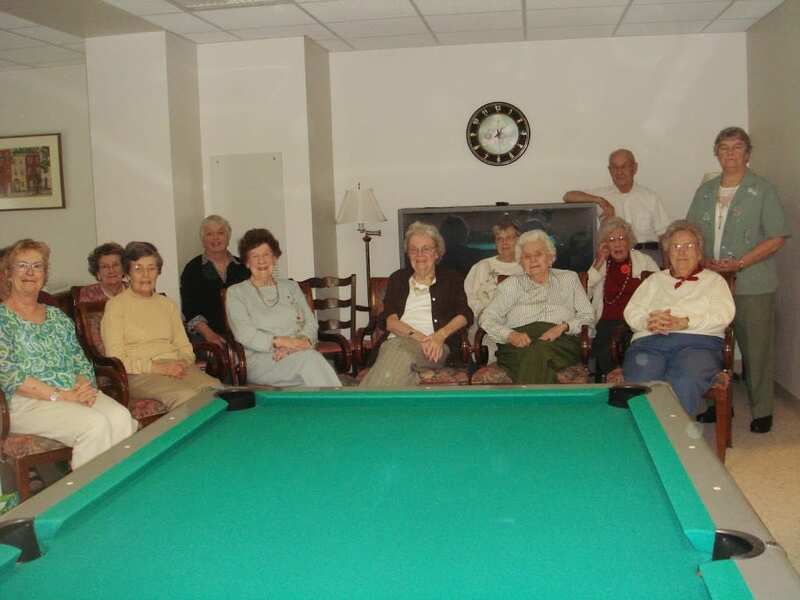 Seven residents from Pickersgill Retirement Community in Towson, Md., get together four times a week to play billiards and they occasionally take their game to a neighboring retirement community to compete. Richard Davidson, a Pickersgill resident who lives at the community with his wife Elinor, is not an “experienced” billiards player, but picked up the game a year ago and sharpens his skills regularly with the group. 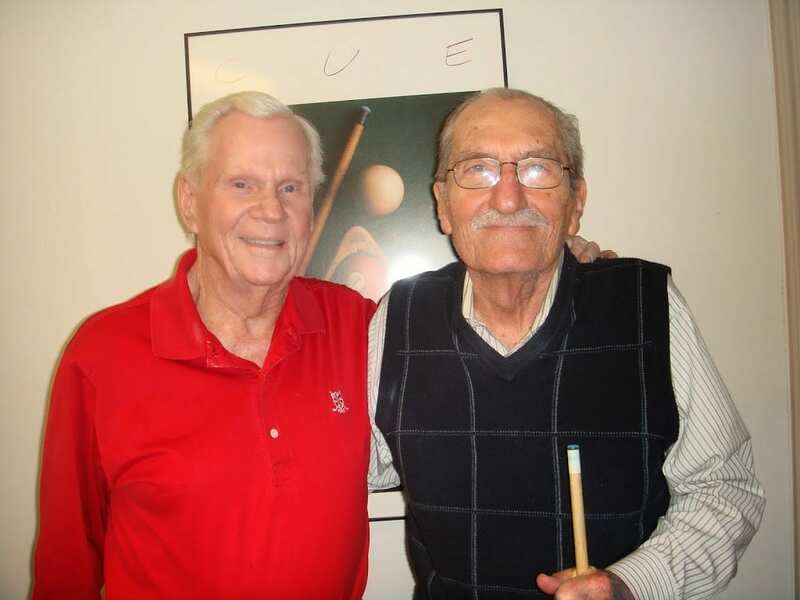 Though Davidson doesn’t play competitively often, he and the six other members of the billiards club travel every few months to nearby Blakehurst Retirement Community to compete with their residents’ billiards team. Throughout the game play, the score remains pretty even for the players on both teams. Davidson and his wife described Pickersgill resident Jack Moore as the top billiards player in the group with his ability to perform impressive shots, and the player to watch when competing or just playing casually. Along with billiards, Pickersgill offers many different activities for residents to participate. Davidson likes playing Wii bowling and bridge when he isn’t sinking shots with his billiards friends. He also looks forward to the summer weather when Pickersgill will open their seasonal horseshoe pit. 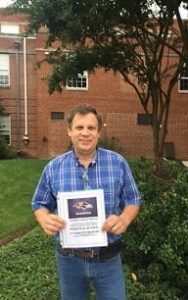 Davidson enjoys as many activities Pickersgill offers residents as he can; meeting people and participating in different events are two of the reasons he and his wife enjoy living at the community. Founded in 1802, Pickersgill Retirement Community is named after one of its early board presidents, Mary Pickersgill, the seamstress who created the American flag that inspired “The Star-Spangled Banner.” Today the nonprofit retirement community offers a continuum of retirement living accommodations, including brand-new assisted living rooms and suites. To learn more, visit us online atwww.pickersgillretirement.org, or feel free to give us a call at 410-825-7423. Independence and involvement are yours at Pickersgill! ©2017 Pickersgill Retirement Community. All Rights Reserved. Website by Love & Company.